Confession. I, Kyle Coughlin, have absolutely no center of balance and cannot skateboard for the life of me. I have always been envious of all the cool kids with their tricks, kicks, and spin jumps. What does that have to do with anything on Paper Darts? Nothing. It was this realization that sparked the idea for this week's blog entry. Although I lack the ability to ride a skateboard, a lot of my friends growing up were talented riders. I always found it interesting how they would watch a million skate tapes (remember VHS?) before going out to ride. They would watch these pro-skaters and always say things like "I could kill that trick so much harder than that guy" or whatever kids said back then. Have you ever been traveling and noticed how boring most hotel rooms are? Room after room appears to be the same bad set design out of a 1970's B movie. From the terrible floral pattern on the overly tucked bed sheets to the paintings that look like they were made in a Creative & Crafty After 60 class at your local rec center. A blank page can sometimes seem overwhelming. That is when you need to put your ego aside for a moment and make a goal to just fill a page. Anything can come out and it does not need to be perfect or that well thought out. Here are a few examples of sketchbook doodles for inspiration to tackle all that white space. 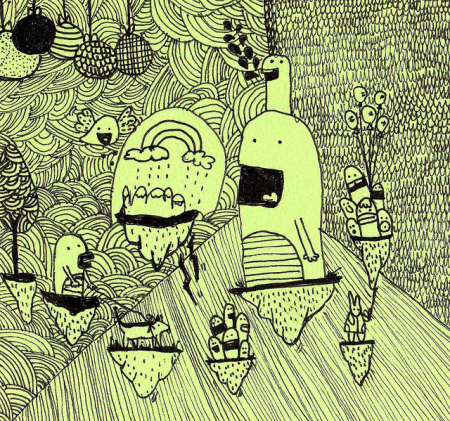 For additional doodle inspiration, check out Doodlers Anonymous. hile looking for typographical inspiration for the third issue of PD, the first place I thought to look was Jessica Hische’s portfolio of hand crafted lettering. Her work is filled with so much beautiful color and fine detail that it makes me want to only draw letters for the rest of my life or just give up drawing all together. What a quandary. Paper Darts asked Kylo Moonguts to share some of his favorite street art from around the world.